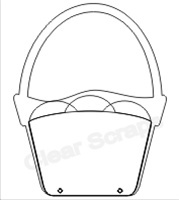 Clear Basket brag bag comes with 5 pages, no rings. 1 front, 1 back and 3 unique inside pages. Stamp, paint, ink, emboss and embellish this one of a kind album. Great gifts for teachers, friends, families and especially grandparents! All Clear Scrap albums come with a protective film that MUST be removed before embellishing. Album will be crystal clear.